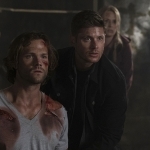 Supernatural has reached the milestone of 200 episodes and to celebrate the writers penned a love letter to the fans. That’s the best way to describe this episode because it was everything I was hoping for and more. There were tears and laughter, joy and sorrow. And above all there was family. Because, in the end, that’s always what it’s been about. I’ll admit that I was a bit hesitant when I heard that not only would the 200th episode be a musical, but it was called “Fan Fiction.” The show does meta well, but there’s always the possibility that one of these times they’d crash and burn. With the amount of build-up the landmark event was getting all over media, it had a lot to live up to. It delivered in spades. There were so many shout-outs and meta moments that it was hard to keep track. And it was led off with a run of almost every title card that has appeared over the years. Let the trip down memory lane begin! I loved the repeated mentions of the Samulet (because that’s what it’s called!) and the fact it kept hitting Fake!Dean in the mouth because that was Jensen’s repeated complaint. And that the fangirls brought up the fact he never should have thrown it away. I understand that Dean doesn’t need a symbol to show how much he loves Sam, but we love it and we miss it. And the ending moment of having Dean hang the fake one over the rearview mirror and looking over to Sam made it a bit better. 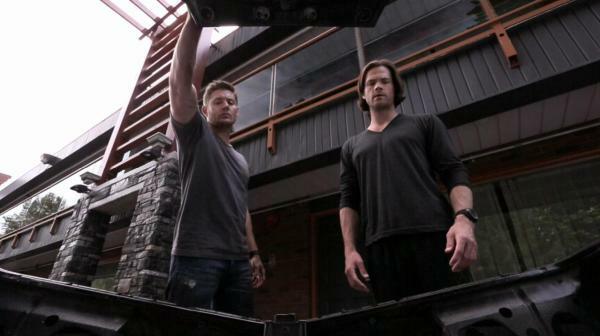 Their bond is deep and unwavering, whether Dean wears a physical symbol around his neck or not. The original songs were all good. “The Road So Far” was a nice summary of the journey, and “A Single Man Tear” was a wonderful shout-out to Jensen’s one-perfect-tear that he has used for Dean time and time again. Then we had the boy melodrama mentions of the two brothers because, well, subtext. And the slash pairings that permeate the show. I did enjoy Sammy trying out the Dean/Cas pairing names to figure out what sounded best, then moving on to the Sam/Cas pairing names because of equality or something. Whatever the reason, it was hilarious. And the Cas song of “I’ll Just Wait Here Then” was so very fitting for the character. Oh, Fake!Cas, you were adorable. Everyone was adorable, and loving, and it was just one big happy fest of fun. We even got a mention of Adam, the forgotten half-brother. Ha! I still mourn for you, Adam, even if your brothers have forgotten you down in the cage. There was, of course, a case to go along with the love-fest. The scarecrow being the visual of the monster was perfect, since it’s long been a favorite monster from the series run. This interpretation with the vines was even more scary, and with Calliope as the one pulling his strings he had even more power behind him. 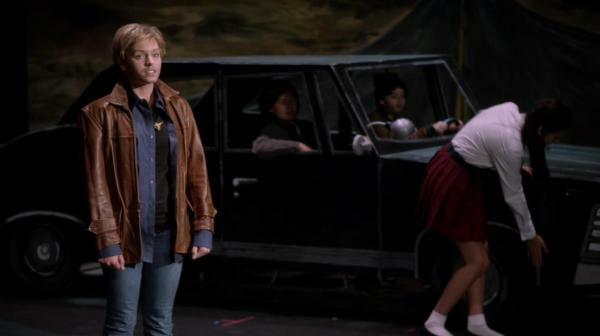 I did enjoy Calliope, too, even if we didn’t get a lot of time with her. 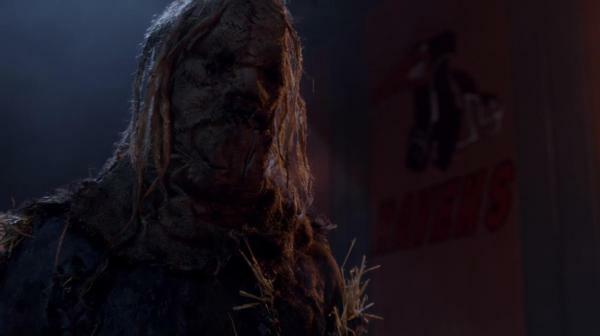 And it provided a great duality of having Fake!Sam killing the scarecrow at the same time Sam killed Calliope. It was quite a way to end the musical! 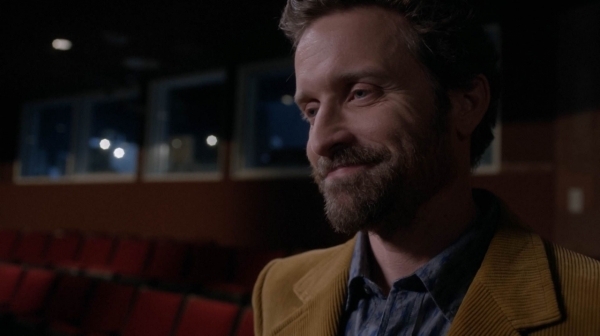 And a good arc of having Dean being unamused over the musical at first, with Sammy being into it, then Dean finally learning to live and let live with the different interpretations of their life. 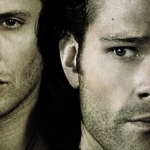 Fanfiction of the Winchester Gospel is always going to be varied interpretations of the canon, but that’s what we love. All our interpretations are just as valid, and the show set out to reinforce that fact. It was a love letter, through and through. The ending of the episode was picture perfect. 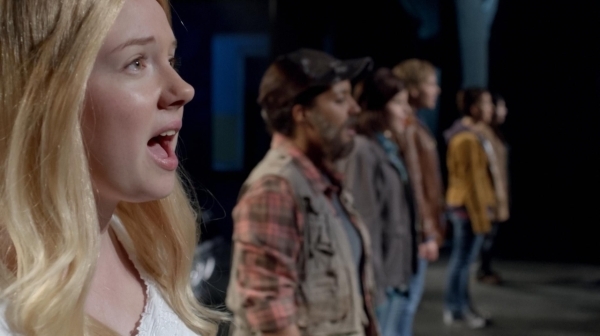 The chorus of “Carry On My Wayward Son” was so touching and even the boys were tearing up. That would have been enough, but then Chuck showed up! That was the best ending I could have imagined. I did cry then, really and truly. “Fan Fiction” — fan tested, God approved. And a wonderful way to say thanks to the fandom. 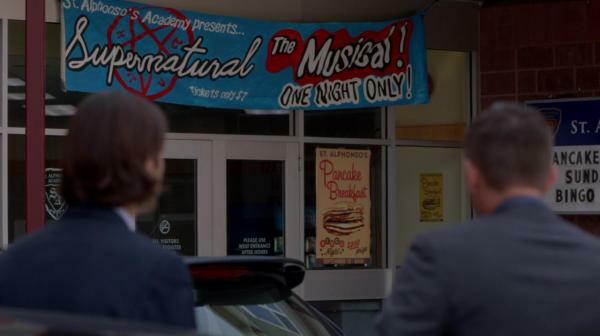 Thank you, Supernatural, for the journey. May the road continue on for many more episodes to come.